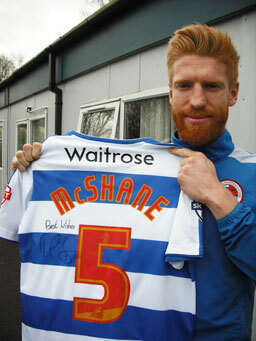 Reading captain Paul McShane has kindly donated a match worn shirt. Don't worry although it shows the signs of battle it has been washed! And we're giving you the opportunity to win it in our latest free to enter completion. Paul joined Reading last summer from Hull City. A vastly experienced defender, he has spent most of his career in the Premier League, playing for West Bromwich Albion, Sunderland and Hull. He started his career having come through the youth system at Manchester United, winning the FA Youth Cup there in 2003. He also has a wealth of international experience making 31 appearances for the Republic of Ireland at senior level, making his debut against the Czech Republic in 2006 To be in with a chance of winning his shirt, just answer this question and get your entry into us by 1 April 2016. Good luck. PAUL WAS PART OF THE HULL CITY TEAM THAT WERE BEATEN IN THE 2014 FA CUP FINAL. WHICH LONDON CLUB BEAT THEM? By entering our competition you agree to receiving future communications from the Reading FC Former Players' Association. These infrequent communications include newsletters, details on future events and competitions.